A popular thought experiment is to decide where you would like to travel in time (my top three would be: back to see the dinosaurs, Victorian England, or a future moon colony on Mars). Elements of time travel have been used in classic works like Charles Dickens’s A Christmas Carol, Mark Twain’s A Connecticut Yankee in King Arthur’s Court, and H.G. Wells’s The Time Machine. Right now we have the hugely popular Outlander series by Diana Gabaldon and the continuing phenomenon of Doctor Who. So if you are like me and can’t get enough of the “wibbily wobbly timey wimey” stuff as David Tennet’s Doctor would say, check out time travel works by two of my favorite Science Fiction Authors and my favorite time travel movie, Groundhog Day. Kage Baker is one of my favorite authors. She unfortunately passed away too soon in January of 2010 at the age of 41. Some of the unfinished works she left behind were published after her passing, but I’m sure she had many more amazing works in her. We are, however, lucky that she concluded her excellent science fiction series The Company. The novels chronicle the tales of cyborgs who are created when members of Dr. Zeus Inc (or “The Company”) travel back in time and grant immortality through technology to children who would have been killed at a young age. The operatives’ mission is then to live forward in time and to preserve objects of art and endangered species for future generations. The company’s efforts are not simply altruistic though and these efforts create a vast fortune for the organization in the future. 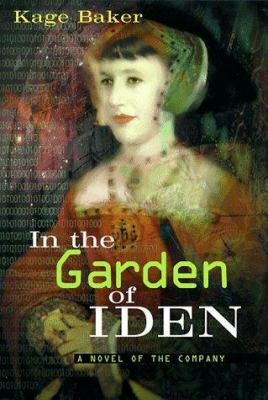 The first book, The Garden of Iden, is set during Renaissance England and centers around Mendoza, a new operative who has just come of age and is on her first mission. She is trained as a botanist and because she had to live through the Spanish Inquisition during her mortal life she expects to want nothing to do with the regular humans around her, but that changes when she meets the passionate Nicholas Harpole, Sir Walter Iden’s secretary who also resides at the estate where Mendoza has been stationed. This book packs inside a love story, a coming of age tale, science fiction, and historical satire. The series in later books continues to explore in greater depth the mysterious Company and follows the stories of a variety of the operatives; the next novel in the series focuses on Mendoza’s mentor and father figure, Joseph, but fans of Mendoza will be pleased to know that she reappears throughout the books. She plays a pivotal role in the last Company novel, The Sons of Heaven, which reveals what happens in July 9, 2355 when all transmissions from Dr. Zeus to its operatives mysteriously stop. Connie Willis is another favorite author of mine. She has written several time travel books that while not a “series” all take place in the same alternate universe: Doomsday Book, To Say Nothing of the Dog, Blackout, and All Clear. Willis first wrote about her time travelers in her short story Fire Watch set during the Blitz, which is available in several short story collections available at BCCLS libraries including The Best of Connie Willis, The Winds of Marble Arch and Other Stories, and Fire Watch. The stories feature historians who go back in time to study history from a first-hand perspective. The time travelers are generally prevented from making alterations to history since the equipment will not function or send them to a different time than originally selected if it will cause an alteration in history or a paradox. This leads to some of the drama since the historians may not be fully prepared for the situation they encounter, this is especially true of my favorite of her works Doomsday Book, which is set during the Middle Ages. Within Doomsday Book there is an interesting parallel between the Influenza outbreak that is occurring in the future with the bubonic plague that is happening in the past; the story feels very relevant today with the recent Ebola outbreak. To Say Nothing of the Dog: or, How We Found the Bishop’s Bird Stump at Last, is much lighter and more comedic in tone than the other novels. 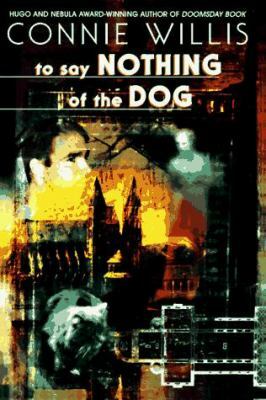 Jerome K. Jerome, whose Three Men in a Boat, To Say Nothing of the Dog, inspired the title of the work makes a cameo appearance in Willis’s work. Although the books are set in the same universe and contain a few of the same characters, in general the books do not need to be read in any order and can be enjoyed individually, with the exception of Blackout and All Clear which were intended as a two volume work set during World War II in England. Blackout definitely leaves the reader hanging, so you may want to check out both books at once so you don’t have to wait to learn what happens next; the six months I had to wait between them when they first came out seemed like an eternity without a time machine to jump me ahead. The movie Groundhog Day unlike the novels mentioned above doesn’t feature purposeful time travel, but instead features a jaded weatherman, played by Bill Murray who must relive the same day over and over and over again. I’ve watched the movie almost as many times as Larry relived his visit to Punxsutawney, PA for Phil, the groundhog’s big reveal. The redemption story and romance between Bill Murray’s Larry and Andie MacDowell’s Rita, are sweet, but it is the humor that makes this a repeat viewing favorite. It is fun to see how Larry interacts with the town’s people each day and how gradually even if the day doesn’t change, he does. For me if not exactly in storyline, in spirit it captures a bit of A Christmas Carol. Tim Minchin and Matthew Warchus who created Matilda the Musical, are planning to adapt Groundhog Day as a musical this year. I can see some very funny songs coming from the setup, but not sure how I feel about a singing groundhog. 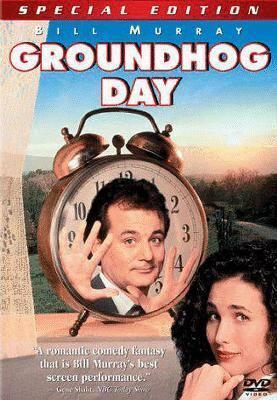 Since Groundhog’s Day is coming up next month (February 2) it is the perfect time to check out this classic fun film. And for a tasty treat while you watch, you could also celebrate in my family’s favorite traditional way with crepes. In French tradition if you can flip a crepe fully over in one toss in the frying pan while holding a coin on Groundhog’s Day, you will have good luck for the rest of the year (and if you don’t succeed you are still lucky enough to have some tasty French style pancakes to eat).